Being different is hard, but it can also qualify you as a superhero. 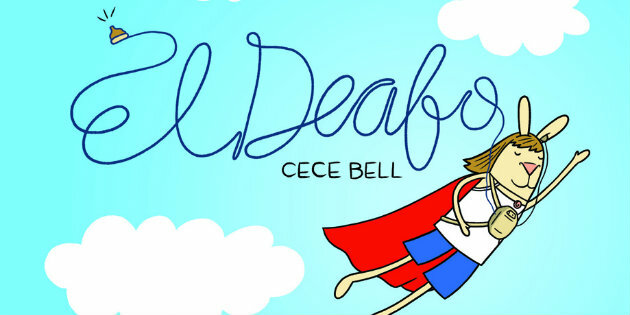 El Deafo is Cece Bell’s graphic memoir of her elementary school years–of starting at a new school, making friends, trying to find her place in the world, all while learning to cope with the severe hearing loss brought on by an early childhood illness. 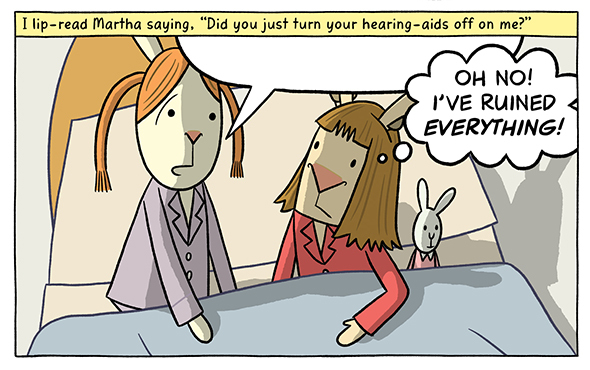 Being different is difficult, and Cece struggles to fit in with her classmates, none of whom have to wear a massive hearing aid under their shirts like she does. 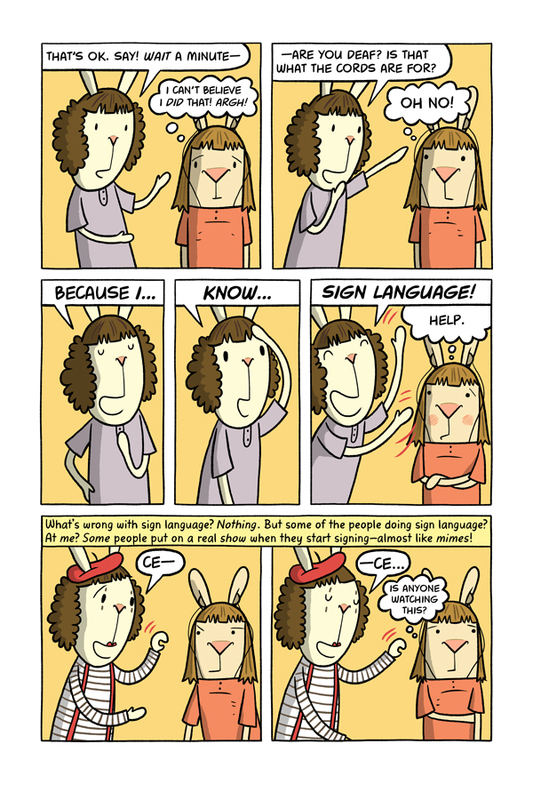 Everything about El Deafo is deceptively simple. The art, the writing, the storyline–all are clear and straightforward and eminently readable. But the expressiveness in those simple little faces and the deft communication of the very real aches and joys of Cece’s daily life are the marks of a master storyteller at work. The simplicity is all part of the (not at all simple) effect. This book has gotten quite a lot of attention in the book world recently. It was even a Newbery Honor book at the ALA awards last month, which is a first for graphic lit. Given all the buzz, it’s very possible you’ve been hearing about El Deafo already, but that doesn’t mean you’ve read it yet. I heard A LOT of great things about this book before I finally picked it up. So if you’re like me and you haven’t gotten around to it yet, let me just say this: El Deafo is everything you’ve heard and more. 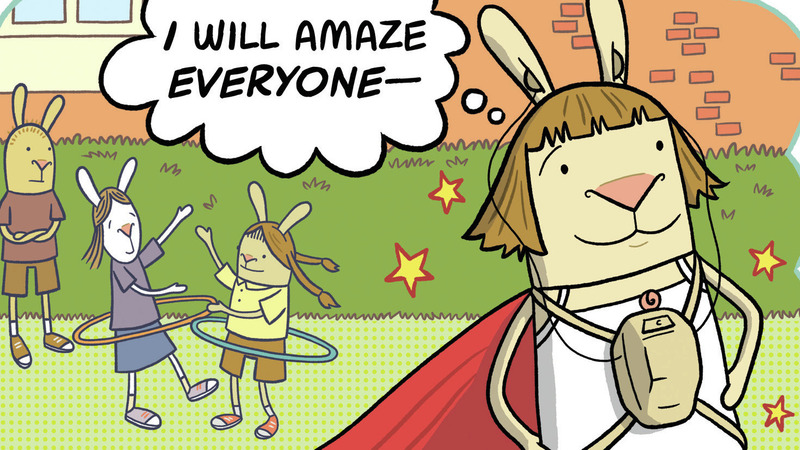 And if you’ve never heard of this book in your life, then let me say this: El Deafo is wonderful. This entry was posted in March 2015 and tagged cece bell, comics, el deafo, graphic lit, graphic memoir, kidlit, kids graphic lit, March 2015, superheroes. Bookmark the permalink.